The NS-10M PRO, NS-10M STUDIO and NS-10MC upgraded NS10 models came out together nine years after the original NS-10M. 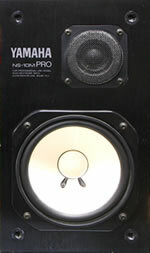 They were Yamaha’s response to thel NS-10M’s unplanned but welcome popularity as a near-field mixing monitor, and they contained adaptations which addressed issues that had arisen during the NS-10M’s use in the studio. All of the three new, upgraded monitors had similar specifications to each other, and differed mostly with regards to their orientation and placement. Most NS10 haters haven't heard these models. They had new terminal connectors on the back, nominal input increased to 50W (the original NS-10M was 25W), increased maximum input to 120W (the original was 60W), and extended bass down to 60Hz (the original was 85Hz). The “tissue issue” of the NS-10M was resolved with a redesigned tweeter to subdue the harsh high frequencies that had been an issue for producers and engineers. The tweeter grill was also more angular and protruding in appearance. On the two horizontal models (STUDIO and MC), the tweeter was placed on the outside of the speaker, slightly further from the listener than the bass. The new crossover circuit was adjusted to give more load to the mid-bass driver, and Yamaha also stated that they had an overall sturdier build, possibly refering to the modified box material, and/or the new horizontally designed versions. NS-10M PRO (aka NS-10M Professional, NS-10MP): This model is the most similar in appearance to its predecessor, the original 1978 NS-10M, because it stands up vertical and has a removable front cover (black or gray). The obvious visual differences it has with the original are: the name label next to the tweeter (which tells you clearly it’s an NS-10M PRO), the new tweeter design & poking-out grill, the new terminals on the back, and the absence of the black & white, detailed specs sheet on the back. NS-10M STUDIO (aka NS-10MS, NS10MS, ns10s, ns-10s, NS10’s, NS-10M’s etc. ): One of only two NS10 models that sits horizontally (the other is the MC). The name label is also turned 90 degrees, accordingly, and states clearly that it is an NS-10M STUDIO (all capitals) model. It is the only NS10 that has no front cover option, and thus no holes for the cover to clip into. NOTE: If the speaker you’re looking at is not designed to sit horizontally, then it is not an NS-10M STUDIO. Many people selling the original, older, vertical NS-10M falsely claim that their speaker is an “ns10 studio” model, which causes lots of confusion. NS-10MC (aka NS-10M Consumer, Commercial): The same as the STUDIO model except that it’s designed to be suspended or mounted, and thus has holes for this. It is one of only two models that sits horizontally (the other is the STUDIO) and it's name label is turned 90 degrees to accomodate this. Unlike the STUDIO model, it has the option of a removable cover. It can be suspended via the Yamaha BWS50 260 Wall Mount Bracket. NOTE: I’m not sure whether any adjustments were made to the NS-10MC to compensate for the lack of boundary reinforcement that would/could come from being mounted, rather than sitting on a mixing desk or bookshelf. If you have any info on this, please contact me, I’d love to know. NS-10M PRO stands upright and has 4 holes in the corners for the optional front cover. NS-10M STUDIO sits horizontally on a desktop and has no front cover, so no holes. The NS-10MC also sits horizontally, but can be suspended or mounted on brackets and has an optional front cover.